German Foreign Minister Steinmeier has visited the central-Asian Republic of Kyrgyzstan, praising the country as a "living democracy." However, he also highlighted the growing threat posed to the region by extremism. 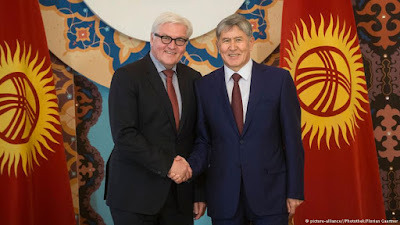 While touring Bishkek, the capital of the former Soviet Republic of Kyrgyzstan, German Foreign Minister Frank-Walter Steinmeier promised to deliver further funds in aid to help the country maintain a stable democracy. Following a meeting with President Almazbek Atambayev, Steinmeier announced that Kyrgyzstan paid an "exceedingly important contribution to guaranteeing stability in the region as a living, parliamentary democracy." With the so-called "Islamic State" movement gaining influence in the region and recruiting a fast-growing number of locals to fight for them in Syria and Iraq, Steinmeier also stressed that a strong democracy provided a good measure to prevent "radicalism and fundamentalism from taking hold." Kyrgyz Foreign Minister Erlan Abdyldaev said, however, that in order maintain that standard, the country needed more money. "We also wish for our country to be open and democratic. But democracy cannot thrive in poverty," he said, according to the German DPA news agency. With the country's economy relying largely on the mining of coal and gold, 40 percent of its 5.7 million-strong population are currently living below the poverty line, according to the International Monetary Fund. But with Russia's economy dragging many of its former Soviet republics down as well, stability and safety come at a cost, which the landlocked republic can barely afford. Kyrgyzstan was Steinmeier's second stop in a three-day-tour of the region. Having visited Uzbekistan earlier, the foreign minister prepared to head for his final stop on the itinerary, Tajikistan, where he is due to meet with authoritarian President Emomali Rahmon, who has been ruling over the impoverished mountain state since it broke off from the USSR in 1991.